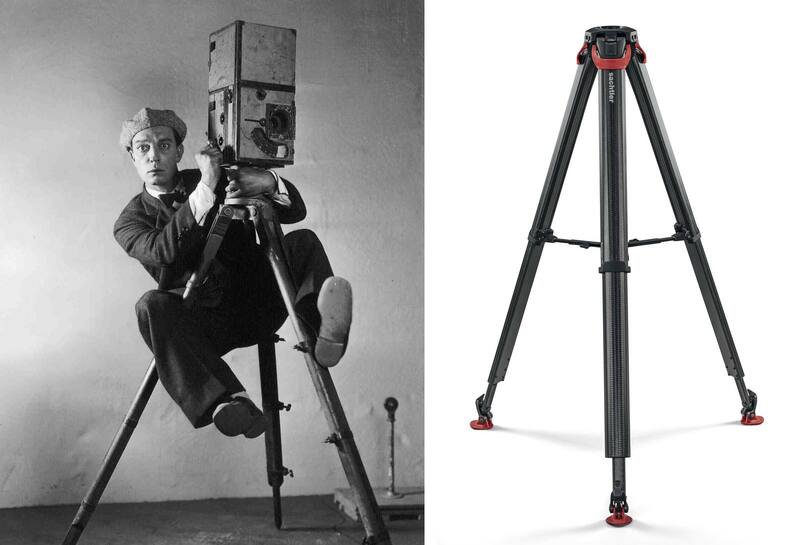 Tripods haven’t changed much since the birth of cinema, the founding of Vinten in 1910 (later to become Vitec), or Buster Keaton. Until now. Vitec’s new flowtech™ 75 tripods will be at IBC in both Sachtler and Vinten brands. And yes, “flowtech” is all lower case. Download FDTimes’ 3-page PDF, including a visit to the factory in Bury St Edmunds. These quick sticks are an entirely new concept in camera support. They abandon traditional tripod design. Gone are typical tubes with locks that are difficult to reach. 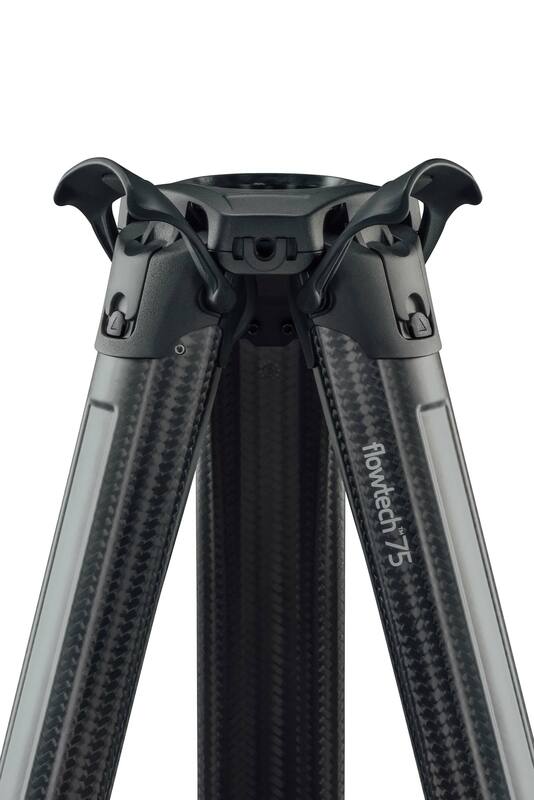 Flowtech tripods are made of lightweight carbon fiber. Brakes and levers on top let you easily adjust length and level in seconds. Flowtech 75 is a two-stage carbon-fiber tripod that can carry camera systems up to 20 kg (44 lb). They come with a spreader that attaches and detaches half-way up and adjusts easily. The quick-release brakes at flowtech’s top are a joy to use. They let you open, adjust and automatically level all the legs together in an instant. To collapse, just open the three brakes, lower, and lock. 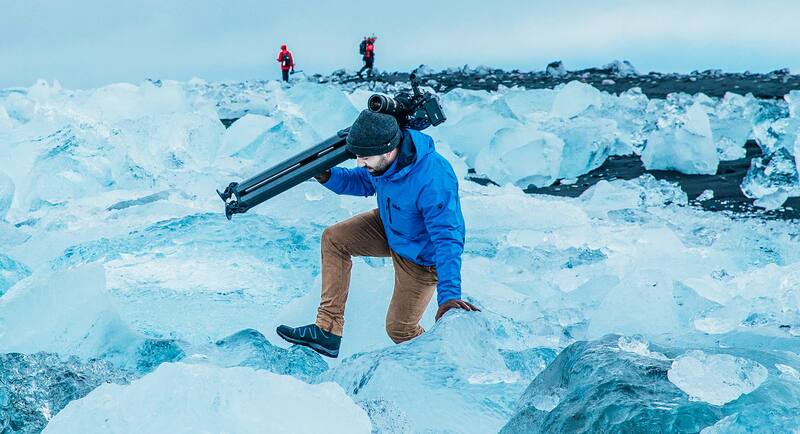 A truly significant breakthrough is how comfortable flowtech tripods are to carry. They rest pain-free on your shoulder like a pair of alpine skis. Magnetic locks keep the legs together. This is an “ah-ha” moment for anyone who has struggled with tripods whose legs would uncontrollably separate at the worst possible moments while two of the tubes dig into your shoulder bone. For low-angles at baby legs height, a hinge-lock mechanism lets you release flowtech’s legs and spread them out at various increments and angles. Flowtech can even become a hi-hat, with the legs spread out horizontally on the ground. Better still, you don’t have to remove the camera and fluid head to move among different heights. Now, one flowtech takes the place of hi-hat, baby legs and standard legs. This saves lots of production time. You’ll never miss a shot again because of support setup time. Flowtech 75 adjusts from 26 cm (10 inches) to 153 cm (60 inches) without the detachable spreader, and 63 cm (25 inches) to 157 cm (62 inches) with spreader. Flowtech is solid, rugged and rigid. It will not twist when panning or tilting. Which brings us to the story of how it is built. This winter, we visited Vitec Videocomm’s factory in Bury St Edmunds. It’s an hour and a half north of London. This is where flowtech tripods are made in a brand-new, high-tech, very expensive and extensive carbon fiber fabrication facility. A massive machine the size of a school bus weaves giant spools of carbon fiber filament into braids. It almost looks like a Chinese finger trap, the woven toy you stuck your fingers inside and couldn’t get out as a kid. Next, the braids are cut to size and epoxy resins added. After baking under high heat, a flowtech section emerges. These are assembled, tested and ready to ship. Steve Kenchington knows a thing or two about design and carbon fiber. He was a co-founder of Litespeed/Caterham Formula One Team and now is VP of Engineering at Vitec. Steve explained how prototype flowtech tripods were subjected to 30,000 lab-test cycles of continuous opening and closing, along with 1.5 million brake lock and unlock cycles (below). Next, they were tested in the most hostile environments: mud, rain, salt water, snow, sand and all the outrageous places where camera crews normally venture. The result is a rugged support system that doesn’t rust and will self-drain water, sand and mud. Flowtech 75 works with all Sachtler and Vinten 75mm ball fluid heads. It is also compatible with most other 75mm ball brands. It is an ideal companion for the Sony PXW-FS7 II, RED Raven, Blackmagic URSA Mini Pro, Canon EOS C100/200/300 Mk II, and many more. MSRP of the new flowtech 75 tripod is $1,050, 810 £, or 960 €. heights without spreader: 26 cm / 10 in – 153 cm / 60 in. heights with spreader: 63 cm /25 in – 157 cm /62 in.